In what turned out to be the most heated and emotional match of the year, the Crook County Cowboys edged the Mountain View Cougars in the final home wrestling match of the season. "Wrestling is an emotional sport," Crook County head coach Jake Gonzalez said following the match. "So yeah, it gets emotional. I love these guys, and I will fight for them." The Cowboys edged the Cougars 37-31, in large part because of a controversial match at 195 pounds that saw Mountain View's Blake Ohlson get disqualified after driving Crook County's Jaxson Rhoden forcibly into the mat. The match turned out to be the turning point in the entire dual. The Cougars held a 25-16 lead heading into the match, and Ohlson was ahead on points when he was disqualified. An Ohlson win would have given the Cougars a nearly insurmountable 28-16 lead. Instead, the Cowboys trailed just 25-22 with four matches remaining in the contest. The Cowboys went on to win three of the next four matches to take the dual meet victory. The dual, which featured the No. 3 ranked class 6A team in the state in the most recent coaches poll against the No. 1 ranked class 5A Cowboys, started off much more calmly than it finished up. Wrestling up a weight class, Steven Ware was able to earn a 9-0 major decision over Tyson Oliver, who is ranked fifth in the state. Ware, who is currently ranked eighth at 113 pounds, took control early and dominated the match. "I relied a lot on technique because he was a lot stronger," Ware said. "I knew that my technique was better than his, so I figured if I just stuck to that and stuck to the basics I would be able to beat him." Ware added that how hard the Cowboys work in the mat room during practice also gives team members confidence. "I think we work harder than anyone in the state and our hard work shows," he said. "Not a lot of people can go three rounds, and no one can go three rounds with us. We beat a lot of kids in the third round because we are a lot tougher than a lot of people." Ware's win gave the Cowboys an early 4-0 lead in the dual. Crook County continued to have individuals wrestle up a weight class throughout much of the dual. Cowboy 120-pounder Jace England, who had not wrestled a match for nearly a month, moved up to 126 pounds to take on Mountain View's Ryder Fassett. England took Fassett down early in the first round, but Fassett was able to escape midway through the round. Fassett then earned a reversal in the second round and held on for a 3-2 victory. The match was a sign of things to come in the dual as Fassett spent most of the match tying England up, and rarely took a shot. England was unable to find a way through Fassett's defenses and couldn't score in the match's final five-plus minutes. The match pulled the Cougars to within a point at 4-3, and highlighted the difference in wrestling style between the two teams, with the Cowboys constantly on the attack and the Cougars content to tie people up and counterattack. "If guys are stalling, we have to keep shooting, and we have to find a way to score points," Gonzalez said. "We have to get to them and get take downs to score points. I can only control how our guys wrestle." Next up for the Cowboys was Hunter Mode, who moved up from 126 to 132 pounds for the dual. Mode, who is ranked No. 1 in the state at 126 pounds, made quick work of his match, pinning Trent Mills in just 1:17. The fall gave the Cowboys a 10-3 lead. However, that lead would prove to be short-lived. Normally, Zach Mauras would have wrestled next for the Cowboys. Mauras is ranked No. 1 in the state at 132 pounds. Unfortunately, Mauras was injured late in last weekend's Reser's Tournament of Champions and was unable to wrestle. Trailing just 10-6, the Cougars sent out Beau Ohlson, who is ranked first in the state at 138 pounds, against Crook County freshman Brayden Duke, who is ranked sixth at 145 pounds. Duke turned out to be no match for the more experienced junior, who pinned him just 1:22 into the match. Mountain View continued to dominate the middle weight classes as Cannon Potts outpointed Crook County's Ben Sather 6-2 at 152 pounds before No. 2 ranked Carson Fassett took an 8-0 decision over Crook County's Gavin McLean at 160 pounds. When former CCHS wrestler Colton Burkhardt, who is ranked third at 170 pounds, pinned Crook County's Garrett Bond early in the third round of their match, the Cougars had built a 25-10 lead. That's when most of the drama for the night really began. Cowboy fans were anticipating a matchup between Kyle Knudtson, ranked No. 2 at 170 pounds, and Blake Ohlson, who is ranked second at 182 pounds. Prior to each match, the Cougars made two lines of wrestlers, who applauded as their next wrestler came out to the mat. Instead of Ohlson coming onto the mat after what seemed like a lengthy period of time, Mountain View head coach Les Combs came out from between the two lines of wrestlers and announced that the Cougars would forfeit the weight class. Immediately, Crook County fans started chanting, "Send out Ohlson, send out Ohlson," to no avail. The forfeit closed the Cowboys to 25-16 and set up the match between Rhoden and Ohlson. Rhoden, who is ranked first in Class 5A at 182 pounds, did not wrestle at last weekend's Reser's Tournament of Champions due to an injury suffered in a dual meet against Culver. The match quickly became physical with Ohlson tying Rhoden up. Rhoden became increasingly frustrated and was eventually called for unnecessary roughness, giving a point to Ohlson. As the match became more heated, the official twice stopped the action for coaches to talk to their respective wrestler in an attempt to keep control of the situation. Ohlson started the third round on top and when Rhoden attempted to escape lifted him off the mat and slammed him to the floor. Rhoden laid motionless on the mat for a period of time, while Crook County coaches and athletic trainer rushed onto the mat. There was a brief confrontation between a Crook County assistant coach and the Mountain View coaching staff, but order was quickly restored. Eventually, Rhoden was helped to his feet and with support on both sides was able to stagger to the sidelines. The full extent of his injuries and how long he will be out of action was unknown at press time. If Rhoden, a senior, is unable to wrestle at district, it would be a devastating blow to the Cowboys. The Cowboys, who have seen both of their 220-pounders go down with injuries, then forfeited the 220-pound match to the Cougars. Mountain View's original lineup showed them forfeiting the heavyweight match. Instead, they moved 220-pounder Rory Eck to heavyweight. That move was ineffective for the Cougars. Crook County heavyweight Caleb Parrott, who is ranked third in the state, rushed straight at Eck on the whistle, tackling him. Parrott quickly turned Eck to his back and earned a fall, just 30 seconds into the match. "I was definitely a little amped up," Parrott said later, admitting that Rhoden's injury impacted how he wrestled. "It definitely affected my match a little bit. Maybe more than it should have, but I got out there and got the job done." The win left the Cowboys trailing 31-28 with two matches remaining. Tucker Bonner received a forfeit win at 106 pounds, giving Crook County a 34-31 lead. With the lead, all the Cowboys needed was a decision at 113 pounds to win the dual. Tannon Joyner moved up from 106 to 113 pounds and took a 5-2 decision over Caleb Potts to sew up the match for the Cowboys. Although he was happy to have won the match, Gonzalez was quick to point to the upcoming district meet and the work the team still has to do to get ready for districts and state. "Some people wanted to have this dual, so we had it," he said. "You can always learn from competition. Now we are going to have a training week this week and get ready and primed up for districts. This week is just about getting better and getting things tidied up for next week and see how many people we can get qualified for state." Parrott added that the team still has some work to do before district and state. "This match shows what we can do under pressure and shows that we've got some improvement to do in the room," he said. "We can't be writing these last couple of weeks off. We've got to go hard to the very end." The Intermountain Conference meet will be held Friday and Saturday, Feb. 8-9 in Pendleton. The good news for the Cowboys is at least part of their injured wrestlers are expected to be back just in time for the district meet. Although the Cowboys are the clear favorite, the league is probably the toughest in the state with three teams listed in the top 10 in the Oregon Wrestling Forum. The coaches poll rates the conference even higher. Crook County is currently ranked No. 1 in the state, while Redmond is sixth, Pendleton eighth and Hood River Valley 11th. 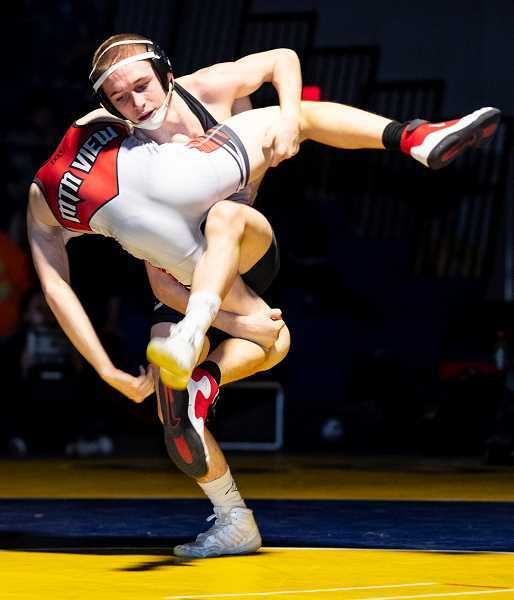 The top four wrestlers in each weight class will qualify for the state meet, which will be held Friday and Saturday, Feb. 22-23 at Veterans Memorial Coliseum in Portland.